Eggs! Perfect nutrition in a compact shell. Eggs make a great addition to any salad or by themselves as a snack or lunch option. Cooking Instructions to boiling the perfect egg every time. Place your eggs in a large stock pot, fill it with cold water to cover the eggs by 1 inch add a sprinkle of salt. Bring the pot up to a boil, immediately remove the pot from the heat and cover with a lid. Let them sit 15- 17 minutes. Cool them to touch, peel and enjoy! Follow the cooking instructions for boiling eggs. Slice each in half and scoop out the yolk into a medium size bowl and mix in the rest of the ingredients. Refill the egg whites with egg filling. 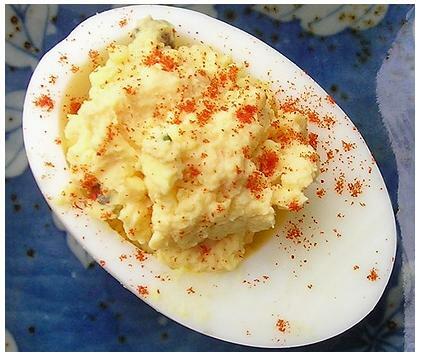 This entry was posted in Holiday and tagged deviled eggs, easter, eggs, healthy, metabolic diet recipes, Metabolic Medical Center Recipes by foodies4mmc. Bookmark the permalink.